Adams dismisses Micheál Martin's "smear campaign"
Gerry Adams says Martin’s comments about the Sinn Féin leader are a distraction from Fianna Fáil’s lack of real solutions and proposals for the economy. 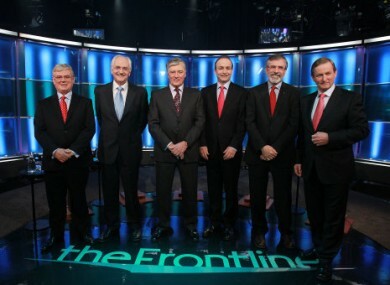 Micheál Martin and Gerry Adams line out with three other party leaders for last night's televised debate. LOUTH CANDIDATE GERRY ADAMS has dismissed comments Fianna Fáil’s Micheál Martin made about him as a “smear campaign” against him and his party. Adams and Martin participated in last night’s five-way leaders’ debate. When Adams said that speculators, developers and some politicans had committed fraud on the state and taken people’s money, Martin responded that Adams was the “last person on this platform to talk about fraud, or to talk about anything like that, given the baggage that you’ve come with from the past”. How dare you talk about fraud among politics and among people down here in the Republic, with what went on for the last couple of years. You have no right to do it, Gerry. You should at least have some sense of humility about the whole situation. Earlier today, Martin said Adams’ comments on transparency and honesty jar with his own position about the past. He mentioned Martin McGuiness’ openness about his former IRA membership and said Adams has a huge credibility issue. “He can’t really talk about truth, honest and transparency”, Martin claimed. Fianna Fáil wrecked the economy and has no real solutions to the mess they created. Gerry Adams said people are struggling to cope with the impact of Fianna Fáil’s budget, while Sinn Féin is offering solutions such as a new budget to reverse cuts and an “end to taxpayers’ money being poured into toxic banks”. Email “Adams dismisses Micheál Martin's "smear campaign"”. Feedback on “Adams dismisses Micheál Martin's "smear campaign"”.